Any chance you can reveal the year of debut for this new thriller? Or maybe a few hints? Anyways, glad to see that Waldameer makes great use of historic structures! Sounds good. Is the new thrill ride for this year or a future year? 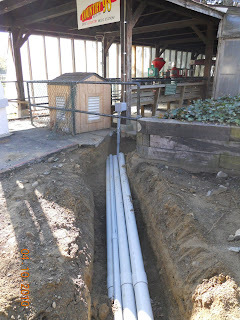 The only information that can be said for the future of the Merry-Go-Round shelter and the possible new thrill ride is that it is not for the 2010 season. Other than that, it's all up in the air! Did that Merry Go Round Shelter ever actually house a Merry Go Round? I know of a few Parks, Beech Bend in particular, that has a merry go round pavilion but its not currently in use. As for future thrill rides... I would love to someday see a KMG Afterburner. They are relatively inexpensive for their size and thrill factor and they have a 48" rider height limit. History Fact: After Waldameer's 1988 season, Waldameer's original wood carved carousel, that was housed in the current Merry-Go-Round shelter, was auctioned off in order to raise money for the expansion of its water park. I have heard rumors of a possible water park expansion in the future. If so, would the expansion include heated water? I love the water par, but when the temperature is below 80, it is hard to swim in the colder water. Is this new thrill ride the same one that was announced in the GoErie.com article back in February, or is this something else (in addition to)? What ever happened to the planned liquid lightning slide? Several years ago there was a nameplate for it between Midnight Plunge and Awesome Twosome. 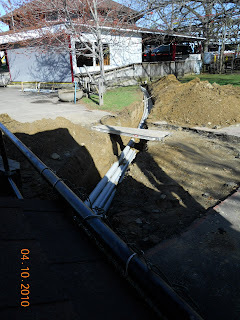 Additionally, there are still unused footers in that area along with a place for the slide to end in the splash pool.